It's easy to get overwhelmed by the many details that come with buying a diamond. After all, this is a major investment, not to mention a highly symbolic purchase. Fortunately, all it takes is a little homework and some basic diamond buying knowledge to choose a gem that you'll love for decades to come. You may remember diamond commercials that indicated you should spend several months' salary on an engagement ring. However, there isn't actually a set guideline about the appropriate amount of money to spend on a diamond. Your shopping budget is a personal decision that's an essential first step in the diamond buying process. Settling on a budget ensures that you will feel comfortable with your purchase and won't risk falling in love with a gem that's out of your financial reach. How much money have you saved toward your purchase? How long do you have to save up for your gem? Are there other major financial goals that may be a higher priority for you at this time? Before you set foot in the jewelry store or begin browsing the diamond selection online, it's important to understand how diamond quality is measured. Jewelers assess a diamond's value based on four important factors, known as the "four Cs," and understanding these criteria can help your choose the perfect gem for you. As you shop, you'll see diamonds and diamond rings labeled with their total carat weight. Because a diamond's shape can influence the apparent size of the stone, jewelers use the carat weight instead of the actual size to describe how much diamond you are getting for your money. Understanding the relationship between carat and gem size is an important part of choosing the right stone. Color also has an effect on a diamond's value. In most cases, the ideal stone is colorless. Diamond color is rated according to how much tint is visible in the stone, ranging from the totally colorless "D" to the visibly brown "Z." You may also encounter fancy colored diamonds, which come in yellow, pink, blue, brown (also referred to as chocolate), black, and a range of other tones. In contrast to white diamonds, the value of these gems is dependent on the vibrancy of their color. Another important consideration in diamond value is the clarity of the stone. This refers to the number and size of "inclusions," or flaws, within the gem. A flawless diamond is worth the most, while a stone with inclusions visible the naked eye has the lowest value. The quality of a diamond's cut is yet another factor that can influence its value. This has to do with the skill and precision of each of the diamond's facets, as well as the proportion of the gem. The more skillful the cut, the more the diamond is worth. As you shop, you may encounter diamonds that have been treated to enhance their clarity or color. Treated diamonds are not as valuable as natural gems, but they also have some advantages. It's important to learn about treated diamonds before you begin shopping. Diamonds come in a beautiful array of shapes. If you have already selected a mounting for your diamond, it may determine the shape of the stone you buy. However, if you are buying the diamond first, shape selection is a matter of personal preference. Pear-shaped diamonds look spectacular in a range of settings. Asscher-cut diamonds have a vintage appeal. Cushion-cut diamonds are classic and beautiful. It's important to note that the diamond's shape may also influence how large it appears. The ideal proportion is different for each stone, and a one-carat diamond in one shape may appear larger than a similar-sized diamond of another shape. Additionally, the number of facets in the shape can cause the diamond to reflect more or less light and, therefore, appear to be larger or smaller. Unless you have an unlimited funds, your budget will dictate that you make some choices about the size and quality of your gem. Each of the four Cs contribute to the cost of the stone, but each factor may not be of equal importance to you. How much do you care about the clarity of the stone? Does it matter to you if there are inclusions that can be seen with the naked eye? How important is the color of your gem? Will you be wearing it in a setting that shows off the color? Do the proportions of your diamond matter to you? Does your setting disguise an imperfect cut? How large a diamond do you want? Is size more important to your than other factors? Do you want a genuine diamond or an artificial gem? Would you be comfortable with a man made diamond? Do you care if you are buying a treated diamond? 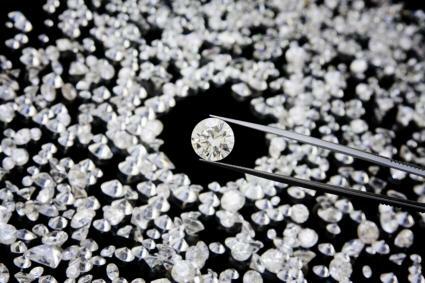 You may have heard of "blood diamonds" or conflict diamonds. These are stones that help to fund wars or are mined in a way that does not respect human rights. For some people, a conflict-free origin of the diamond is a major priority. If this issue is important to you, you may want to consider a Canadian diamond or another safely-produced stone. When you're ready, you can start shopping for your diamond. It's a good idea to begin your search at a local jewelry store so you can see the diamonds in person and decide what's important to you. You may find that color or clarity are less of a priority that you originally thought when you see what these stones look like in person. Then, if you're shopping by price, you can compare your options with similar gems online. BrilliantEarth - This shop is a great source for conflict-free loose diamonds. You can shop by shape, carat, color, clarity, cut, and price. All diamonds are certified. Lumera Diamonds - This store claims to offer their diamonds at a 40% discount over brick and mortar jewelry stores. You can search by shape, and all diamonds are certified. Brilliance - Here, you'll find a good selection of diamonds. You can search by shape or price range, and all gems are certified. 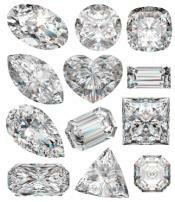 Whiteflash.com - Search this site for certified diamonds in all different shapes, prices, and sizes. To ensure you are buying a genuine diamond, rather than a fake, you should always receive a GIA certificate with your gem. If you are buying your stone online or are uncertain about the quality, consider getting a diamond appraisal from a qualified gemologist or jeweler. Read the return policy at the jewelry store or site to make sure you have the option of returning your diamond if it doesn't fit your desired setting or meet your needs. Shopping for a diamond should be a fun experience. Armed with a little advance knowledge about diamonds and your individual needs and budget, you'll find that the shopping process is far less overwhelming than you expected. Take your time browsing the selection to find a diamond that truly symbolizes your love.